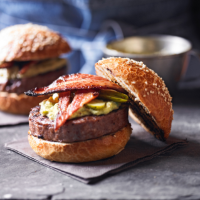 Customise some packs of Heston from Waitrose Ultimate Beef Burgers with smoked bacon and rich and spicy avocado sauce. 1. Heat the oil in a pan over medium heat and cook the shallots until softened, add the smoked paprika and continue gently cooking for a further 10 minutes. 2. Place the avocado cut-side down on the barbecue or griddle pan until the surface has been charred. Add to the shallots mixture and, using a fork, coarsely mash the avocado to a chunky consistency. Mix with the remaining sauce ingredients and season with salt and freshly ground black pepper. 3. Meanwhile, cook the burgers and bacon according to pack instructions, and toast the burger buns. Assemble the burgers - top with the avocado sauce, sliced gherkins and bacon. Add the toasted bun then serve.